In this video, Dr. Huntoon answers questions about the cause of allergies and what you need to consider when treating yours or a loved ones allergies. Click on the link below to listen to the radio show about Allergies. Endless shots or harmful anti-histamines are not your true solution. When you are ready to address the cause of your allergies, we are here to serve you. For many people, allergies are a fact of life. It is estimated that 30% of adults and up to 40% of children suffer from allergies. Allergies are a condition where your Immune System reacts to a foreign substance that does not normally cause a reaction in healthy people. Common allergies include pollen, bee venom, and pet dander. Allergies can also be seasonal, as various plants go through the pollination cycle beginning at different times of the year. Additionally many people suffer from food allergies, also known as food sensitivities. When exposed to an allergen your body’s Immune System produces antibodies. These antibodies are how your body fights off sickness or infection. For people with allergies, the antibodies attack the foreign substance which causes the symptoms many people associate with allergies. It is important to note that the allergen itself is not causing the symptoms, but your body’s Immune System trying to fight it off, even though it is normally not harmful. It is an Immune Recognition System issue that needs to be corrected. Allergy shots and medications will never address this imbalance and will create the basis for other allergies and chronic health concerns to develop. anaphylaxis. Anaphylaxis is a potentially life-threatening emergency requiring immediate treatment. While Medical research continues looking into the underlying causes of allergies, currently most allergies cannot be permanently cured using traditional Medical treatments. However, treatment options do exist to help manage your allergy symptoms. This may include life-time treatments that help you manage the symptoms and will never address the underlying cause for the allergies. For true solutions to the underlying CAUSE of allergies and how you can finally eliminate these annoying immune responses to normal life stimuli, click on Dr. Huntoon's Alternative Medical Treatment Options below. The part of the body the allergen touches affects what symptoms you may develop. Airborne Allergens that you breathe in often cause a stuffy nose, itchy nose and throat, mucus production, cough, or wheezing. Whereas with allergens that touch the eyes may cause itchy, watery, red, swollen eyes. Contact Allergens that touch the skin can cause a skin rash, hives, itching, blisters, or skin peeling. Food Allergies associated with eating something you are allergic to can cause nausea, vomiting, abdominal pain, cramping, diarrhea, or a severe, life-threatening reaction. Medication/drug allergies usually involve the whole body and can lead to a variety of symptoms. Allergies are pretty common. Both genes and environmental factors play a role. The Immune System normally protects the body against harmful substances, such as bacteria and viruses. It also reacts to foreign substances called allergens, which are generally harmless and in most people do not cause a problem. But in a person with allergies, the Immune Response is oversensitive. The body produces an extreme and exaggerated response. When it recognizes an allergen, it releases chemicals such as histamines, which fight off the allergen. This causes allergy symptoms. The Chronic Nature of Allergies? Traditional Health Care providers do not understand the mechanism of allergy formation. They acknowledge the increased Immune Response and will mask it with allergy medications and shots, but that will never fix the underlying cause. Which begs the question, Why would you treat something you do not understand? Having taught anatomy at the graduate school and undergraduate school level for 5 years, Dr. Huntoon appreciates the reason for sickness and the abnormal Immune Response to a normal stimulus. Within each barrier of the body, The Eyes, The Skin, The Respiratory System and The Digestive System, the mechanism of cause is all the same, even though they each present as a different response within the body. Read Dr. Huntoon's Alternative Medical Treatment Options below for the full explanation. A specific allergy is not usually passed down through families (inherited). However, if both your parents have allergies, you are likely to have allergies. The chance is greater if your mother has allergies. This is most likely due to mimicking the behavior of the parent that leads to similar immune responses. Allergies may make certain medical conditions such as sinus problems, eczema, and asthma that much worse. Severe allergic reactions (anaphylaxis) need to be treated with a medicine called epinephrine, which can be life-saving when given right away. If you use epinephrine, call 911 and go straight to the hospital. The best way to reduce symptoms is to avoid what causes your allergies. This is especially important for food and drug allergies. There are several types of medications to prevent and treat allergies. Which medicine your doctor recommends depends on the type and severity of your symptoms, your age, and overall health. Illnesses that are caused by allergies (such as asthma, hay fever, and eczema) may need other treatments. Skin testing is the most common method of allergy testing. One type of skin testing is the prick test. It involves placing a small amount of the suspected allergy-causing substances on the skin, and then slightly pricking the area so the substance moves under the skin. The skin is closely watched for signs of a reaction, which include swelling and redness. Skin testing may be an option for some young children and infants. Skin testing is not always accurate. Consider Dr. Huntoon's Alternative Medical Treatment Options to avoid getting caught up in this form of endless care. Other types of skin tests include patch testing and intradermal testing. Again, these types of testing may not always be accurate. Consider Dr. Huntoon's Alternative Medical Treatment Options to avoid getting caught up in this form of endless care. Medical treatments are used by most people when suffering from allergies. As with all medication, certain side-effects are known and others are not known. It is important to consider the side-effects and to do some research into the medication being prescribed to determine if the side-effects are worse than the symptoms associated with your allergies. It is important to understand that using medication to treat your allergies will only address the symptoms and will not correct the cause. Therefore you will need to use the medication anytime you have the allergy symptoms. Decongestants can help relieve a stuffy nose. Do not use a decongestant nasal spray for more than several days, because they can cause a "rebound" effect and make the congestion worse. Decongestants in pill form do not cause this problem. People with high blood pressure, heart problems, or prostate enlargement should use decongestants with caution. Allergy shots (immunotherapy) are sometimes recommended if you cannot avoid the allergen and your symptoms are hard to control. Allergy shots keep your body from over-reacting to the allergen. Unfortunately, you will have to get regular injections of the allergen. Each dose is slightly larger than the last dose until a maximum dose is reached. These shots do not work for everybody and you may have to visit the doctor often and for several years on a weekly basis. 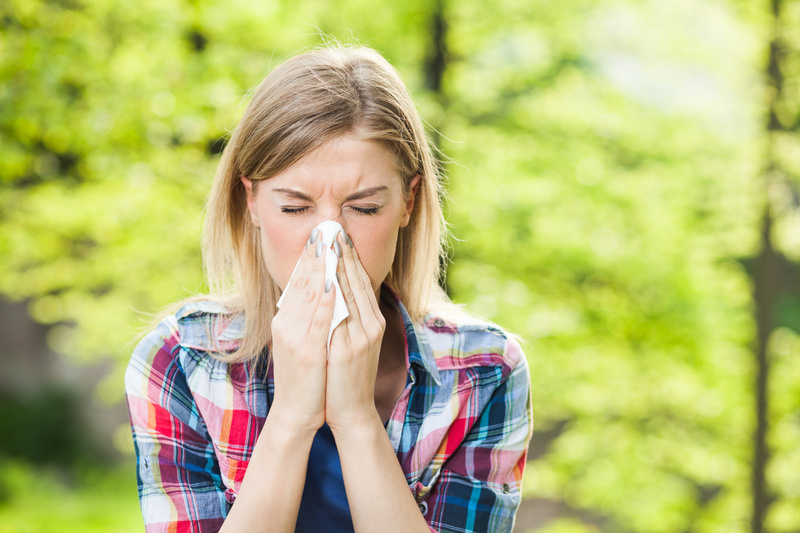 Consider the next section, Dr. Huntoon's Alternative Medical Treatment Options if you truly want to understand and address the underlying cause of your allergies and remedy the problem once and for all. Most doctors are highly skilled at "treating" health concerns. If you are a Medical Doctor, it is based on prescribing medicines to mask symptoms. If you are interested in finding the underlying cause, then you realize using medicines to mask symptoms only creates bigger problems. And there are times when the medicines are necessary to get the person out of their initial crisis. But do not stop there. Allergies are an increased Immune Response to a normal stimulus. But "Why" does this occur? The increased Immune Response is based on the poor digestion of the offending allergen. If the microbiome of the body is highly functioning and efficient, full digestion of the complex proteins will be accomplished and the resulting amino acids will enter the system and all will be normal. If the digestive system becomes abnormal due to the exposure of the Digestive System Disruptors that results in Leaky Gut Syndrome. When one has Leaky Gut Syndrome, as is the case with ALL food/digestive allergies, some of the undigested proteins will leak across the digestive system wall and find their way into the bloodstream. Once a foreign protein enters the blood, the Immune System will go to work at attacking and eliminating the foreign protein. This is a normal Immune Response to protect you from foreign invaders. The Immune Response to the proteins coming in through your Digestive System creates the allergic cascade and causes one, in this case, to have an allergic response to the food that "leaked" through the Digestive System wall. The result? A food allergy. If one has a similar imbalance related to their respiratory system, they will develop respiratory or airborne allergies. If one has a similar imbalance within the skin/integumentary system, they will develop contact allergies. The specific mechanism of each allergy is the same; the location of the Immune Response is different, either in the digestive system, respiratory system or the skin system. Dr. Huntoon has trained thousands of hours and has practiced successfully eliminating allergies ONCE and FOR ALL within his practice base for more than 27 years. Using Manual Muscle Testing is a very common and accepted practice within the healthcare industry for determining an allergic response without invasive medical testing. In association with using the actual substance suspected or by using a testing vial that the person holds, the doctor then tests a strong muscle (usually a shoulder muscle) to see if the substance/testing vial creates a muscle weakness. This form of testing is a far easier way to determine if the body has an issue with a substance and can be considered an allergy. Most practitioners who do muscle testing will also have a form of treatment to correct the allergy response (NAET, NET, NMT or TBM) and allow for the person to overcome the allergy once and for all. In some cases, your medical doctor may tell you to avoid certain items to see if you get better, or to use suspected items to see if you feel worse. This is called "use or elimination testing." This is often used to check for food or medication allergies. This is extremely time consuming and may be problematic when you or your child craves the thing you are asked to avoid, OR if avoiding the actual substance is not possible. Your Medical Doctor may also check your reaction to physical triggers by applying heat, cold, or other stimulation to your body and watching for an allergic response. There are several types of medications to prevent and treat allergies. Which specific medicine your doctor recommends depends on the type and severity of your symptoms, your age, and overall health. Dr. Huntoon has trained thousands of hours and has practiced successfully eliminating allergies ONCE and FOR ALL within his practice base for more than 27 years. Having this condition is not fun at all. Being motivated to look for non-conventional forms of treatment is warranted. Working with a Holistic Chiropractor will offer benefits, as using a well-rounded, multifaceted approach to address all the causes and imbalances within the person. Using Natural Allergy Solutions involving NAET, NET, NMT or TBM is the best conservative way to eliminate allergies once and for all. By correcting the corrupt neurologic response that creates the allergic response in the body, this has demonstrated a positive resolution of the allergies when sticking to a specific treatment plan. Discussing what is involved and the time commitment necessary to having a full recovery is warranted. Call for an appointment with your health care provider if you either experience the symptoms of a severe allergy, or IF an existing prescribed treatment for an allergy no longer works. Your doctor will be able to run tests to properly diagnose the allergic reaction, and will offer you treatment options. In cases of a severe allergy attack contact your doctor immediately. Working with a Holistic Chiropractor will offer benefits, as using a well-rounded, multifaceted approach to address all the causes and imbalances within the person leading to the allergic response. Using Natural Allergy Solutions involving NAET, NET, NMT or TBM is the best conservative way to eliminate allergies once and for all. This has demonstrated positive results when sticking to a specific treatment plan. Discussing what is involved and the time commitment necessary to having a full recovery is warranted. However, changing a mother's diet during pregnancy or while breastfeeding does not seem to help prevent allergies. Based on the mother's health, she may create the basis for her baby to develop allergies if she suffers from Leaky Gut Syndrome, which increases her immune response to foods while the blood continues to circulate between both the mother and the unborn child. There is also evidence that infants who are exposed to certain allergens in the air (such as dust mites and cat dander) may be less likely to develop allergies. This is called the "hygiene hypothesis." It came from the observation that infants on farms tend to have fewer allergies than those who grow up in more sterile environments. However, older children do not seem to benefit. Once allergies have developed, treating the allergies and carefully avoiding allergy triggers can prevent reactions in the future.